Katowice is located about 300 kilometers from Warsaw (Poland capital) and 34 kilometers from the Katowice International Airport (KTW). Advanced Information Technology Center (Polish acronym: CNTI) is situated 2km from the Katowice city centre. The city map with the pinned Faculty location can be seen here . Travelers by plane can arrive at Katowice International Airport (KTW), known also as Pyrzowice. The airport is 34 km (21 mi) from the city center. Katowice is one of the major hubs for Wizzair, as well as a major destination for Ryanair. There is also limited service provided by Germanwings. Major airlines, including Polish national carrier LOT and German carrier Lufthansa also operate routes to Katowice. Katowice Dworzec PKP is the city's major railway center, and is a hub for rail transport throughout Silesia and much of southern Poland. The station serves as a hub for national rail operator PKP Intercity, regional rail company Przewozy Regionalne, and provincial operator Koleje Śląskie. Language: Polish, but most locals will speak English, particularly younger ones. For emergency calls (police, emergency, fire service etc.) please dial 112. It's free of charge. For street maps and route itineraries visit OpenStreetMap or Google Maps . The weather in Katowice in late August is moderately warm, partly sunny with occasional rain. 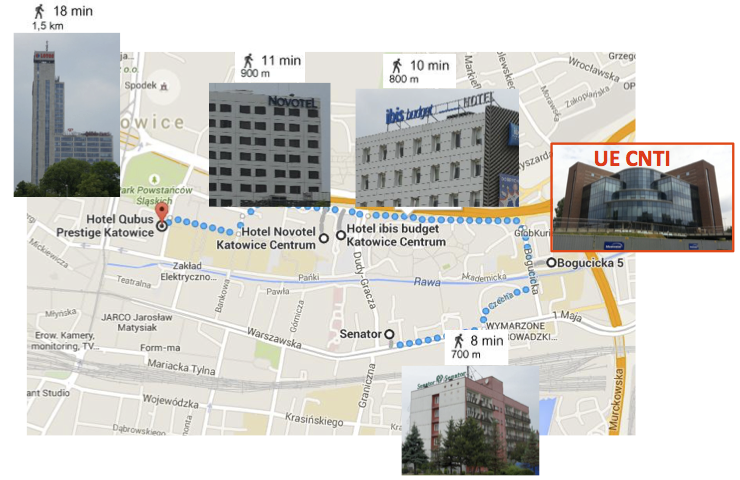 When looking for accommodation in Katowice, you can select between several hotels, guesthouses and a hostel. To get detailed information and images on the belowmentioned accommodation options in the Katowice, as well as the options not listed here, please follow respective links or check Booking.com . Recommended for ISD 2016 Conference Participants! If You stay longer in Katowice, there are several places worth visiting! Approximately every 2 hours from Katowice Railway Station (Polish: PKP Katowice Główny). Information panels at the Railway Station. Information Desk at the Railway Station. Direction – Kraków Główny. On-line schedule. Every 15 minutes from Katowice Bus Station (Polish: PKS Dworzec Autobusowy) Direction – Kraków Główny. Information panels at the Railway Station. Information Desk at the Railway Station. Direction – Oświęcim. On-line schedule. Admission to the Auschwitz-Birkenau Memorial is free of charge. The fees are charged for engaging a guide. Pszczyna Castle (Polish: Zamek w Pszczynie), sometimes referred to as the Pless Castle, is a classical-style palace in the city of Pszczyna. Constructed as a castle in 13th century or earlier, in a Gothic architectural style, it was rebuilt in a Renaissance style in the 17th century. During the course of the 18th and 19th centuries, the exterior of the castle was partially changed into a Baroque-Classical style. 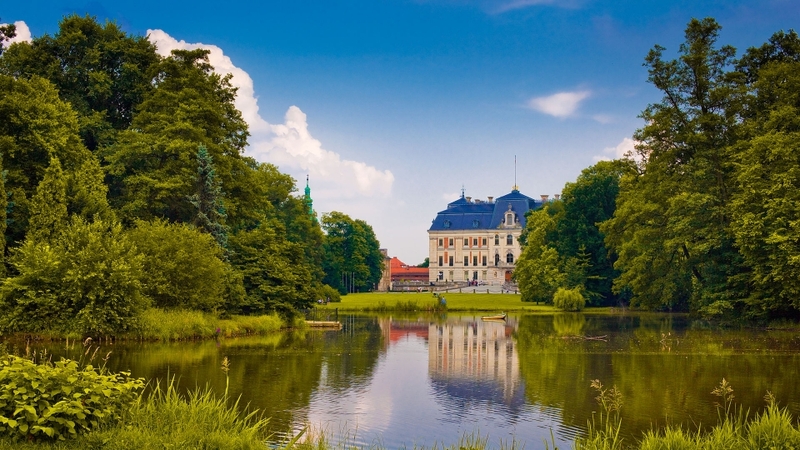 In its history the castle was a residence of Silesian and Polish nobles. 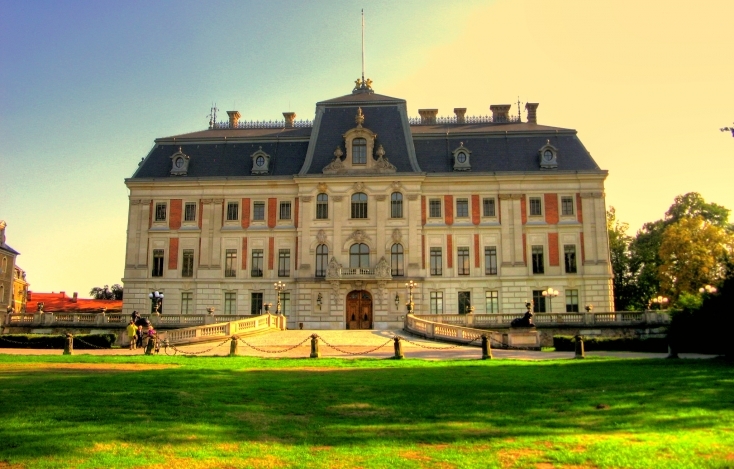 The castle has been state-owned since 1936, after the death of the last Prince of Pless. In 1946 it was turned into a museum operating until today. In 2009 it was voted as one of the "Seven Architectural Wonders of the Silesian Voivodeship" by the Silesian authorities and is often described as one of the most beautiful castle residences in Poland. Pszczyna Park (Polish: Pszczyński Park) is one of the most beautiful parks in the Upper Silesia. Its are is 156 ha. The park is situated along the river Pszczynka, which flows through artificially created ponds and canals. 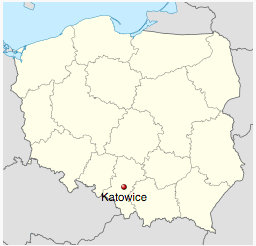 Approximately every 30 minutes from Katowice Railway Station (Polish: Dworzec PKP Katowice Główny). Information panels at the Railway Station. Information Desk at the Railway Station. Direction – Pszczyna. On-line schedule. Approximately 20 minutes walk from Pszczyna Railway Station (Polish: Pszczyna Dworzec PKP) – see the map above. Tuesday-Friday: 9:00 a.m. – 5:00 p.m.